Riding season has finally arrived and many of us here in the Midwest have not had our motorcycles out in nearly 6 months. It seemed like snow and cold weather was in the forecast seemingly every week since Thanksgiving, and cabin fever hit us two wheel faithful pretty hard. Now that the weather has taken a turn for the better, I will be taking this weekend to finish up my spring motorcycle maintenance on my two bikes. Follow my tips below to make sure you are ready to go now that we have some good riding weather! All of these items can be done in your own garage with the help of some basic tools, skills, and a service manual. My take on doing an annual service (and mileage services) is that the margin for error on a motorcycle is already very slim, there is no reason not to take a couple hours each year and make sure everything is in top shape. Tire Pressure – The first spring maintenance item I do every year is check my tire pressure before hitting the road. Now, I typically check pressure a handful of times throughout the winter months as letting the bike sit on under-inflated tires is detrimental to the tires, but they always seem to be a little low after even just a few weeks of sitting on the cold concrete floor of my shop. Shortening the life of your tires aside, riding on under inflated tires can lead to dangerous riding conditions and an extreme change in the handling of your bike. Check with your tire manufacturer to determine what the proper inflation is for your tires. Belt Tension – For those of you with belt driven motorcycles (or chain driven for that matter), checking belt tension is always done before the first ride of the season. Over tightened belts can lead to premature wear on the main shaft pulley bearing and seal, and too loose of a belt can cause “jumping” where the belt actually jumps a tooth on the pulley which can damage the teeth on the belt. There are belt tension tools available so that this can be checked on your own. Fastener Torque – Spring is the perfect time to check torque on all the critical fasteners on your bike. Using the service manual specific to the model of the bike you have, go through and check the torque of your axle nuts, brake caliper mounting bolts, foot brake pedal mount, shift linkage, handle bar mounts, the pinch bolts on the front axle, rear pulley, and for the saddle bag mounts (for you bagger guys out there). I use Blue Loctite on nearly every fastener on my bike. If I take a bolt out while working on something, it goes back in with Blue Loctite. DO NOT use the Red Loctite and unless you never want to take that bolt out. Brake Fluid – Check your brake fluid at the beginning of the riding season to ensure that the level is where it needs to be. Check your owner’s manual and make sure you use the specified grade of fluid for your bike. I also flush my brake fluid every other year. Battery – Did you keep your battery on a tender throughout winter? If not, now is the time to pull it out and make sure it is charged and will hold a charge. It’s a terrible feeling getting geared up for your first ride of the year and not having the bike start, or worse yet, die on you when you are in the middle of a ride. Clutch Adjustment – Checking the clutch adjustment on your bike is simple and is recommended preventative maintenance by most manufacturers. Follow your service manual for the exact steps, but most Harley big twins are the same method. If you are an experienced rider and like your clutch feel to be set a certain way, now is the time to get it dialed in. Make sure the engine is cold when making these adjustments. 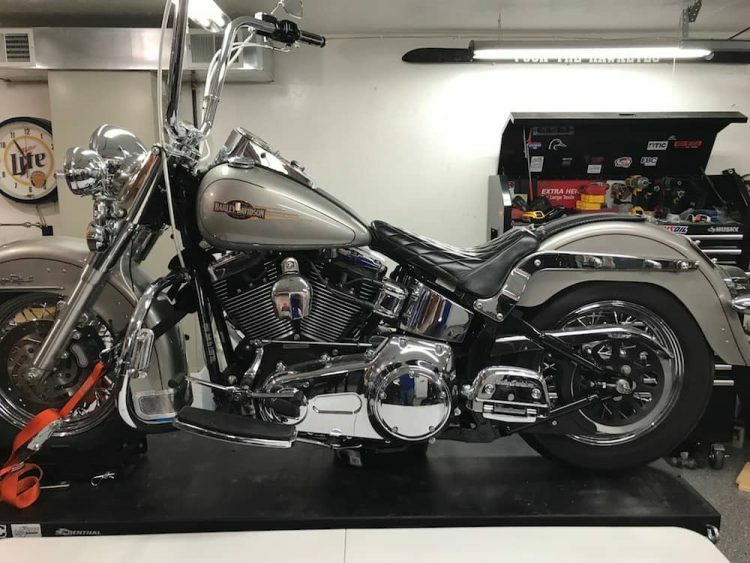 Oil Change – I change all three fluids on my Harleys each spring so that I am set to go for the first few months of riding season. I prefer to use full synthetic fluids in my primary, transmission, and engine for the extended change intervals and also for the cooling effects these oils have on air cooled big twins. Make sure you verify that the oil you use for your primary is approved for use with the clutch in your bike. Any primary fluid from the main oil manufacturers like RedLine, Spectro, Lucas, Bel Ray, etc will meet this requirement. You can order an Oil Change kit here, that includes the oil, filter, O-Rings for the drain plugs, and the derby cover gasket if you also decide to change the primary fluid. Wash – The last part of my spring routine on my bikes is a good wash, clay bar, and wax. I am somewhat particular about my bikes, and a good wash and wax for the year helps ensure the bike’s finish is protected against the rain, grime, and sun that the bike will encounter throughout the riding season. I will wash as needed, but typically only do the wax at the start of the year. That’s it! The bike is ready to ride for the year. If I hit a major mile milestone throughout the year I will perform recommended service at that time (aside from engine oil as I change that every 3,000 miles). This helps keep the schedule set for the next owner if I happen to sell a bike (not likely). Be sure to follow our Facebook page to stay up to date on our blog and our next post that will provide tips on how to change the oil on your Harley!